Our first V-BT01 card is a new Vortex Dragon with an interesting effect. ACT (VC) 1/Turn COST: [Counter Blast 2] Choose one of your opponent’s rear-guards, retire it, if the number of cards in your damage zone is five, discard all cards from your hand, and retire all of your opponent’s rear-guards. 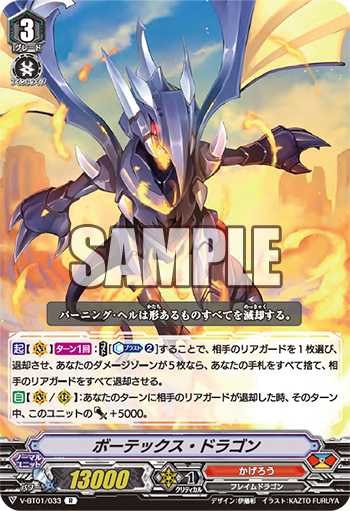 AUTO (VC/RC) During your turn, when an opponent’s rear-guard is retired, this unit gets Power+5000 until end of turn.